NEW YORK, NY--(Marketwire - Feb 1, 2012) - MOSCOT, a New York City institution renowned worldwide for its iconic eyewear -- The MOSCOT Originals, MOSCOT Spirit, and MOSCOT Sun Collections -- opened its doors today at 159 Court Street in the historic Cobble Hill neighborhood of Brooklyn in New York City. Fuhgeddaboudit! The new shop incorporates the same unexpected blend of elements that make the Manhattan shops so fun, eclectic, and inviting, including period details from the original MOSCOT shop on the Lower East Side (circa 1930), and vintage pieces sourced from around the world that ensure an authentic historical customer experience. 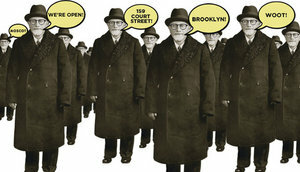 In addition, the street level shop's giant windows (which bear an uncanny resemblance to the original MOSCOT storefront on Rivington Street, circa 1934) provide the perfect canvas for MOSCOT to entertain fans with an ever-changing series of whimsical displays -- the first of which is a cadre of Great Grandpa Hymans assigned to welcome visitors to the new shop. MOSCOT Court Street will stock The MOSCOT Originals, MOSCOT Spirit and MOSCOT Sun Collections, as well as complementary brands, Bevel, Lindberg, Mykita, Paul Frank, and children's eyewear brand, BBig. "MOSCOT has had a home in Downtown Manhattan for nearly a hundred years and for that we're very grateful," said Co-President, Wendy Simmons. "Our opening in Brooklyn is really a return to our roots since Brooklyn was the home of the third generation of Moscots -- and nothing feels better than coming home!" In addition to the newest MOSCOT shop at 159 Court Street in Brooklyn, MOSCOT shops are also located at 69 W 14th Street and 118 Orchard Street in Manhattan. The MOSCOT Collections are available in MOSCOT shops and online at moscot.com, and in specialty retail and optical shops worldwide. For more information on new and existing styles from all MOSCOT Collections, and for a complete list of shops selling MOSCOT eyewear, please visit moscot.com. MOSCOT is a New York City institution renowned worldwide for its iconic eyewear -- The MOSCOT Originals, MOSCOT Spirit, and MOSCOT Sun Collections. MOSCOT infuses its unmistakably refined, downtown aesthetic with nearly 100 years of eyewear expertise and unparalleled craftsmanship to create its timeless eyewear. While now recognized as a global lifestyle brand, MOSCOT remains, at heart, a neighborhood optical shop. For more information on MOSCOT and The MOSCOT Collections, please visit moscot.com. The MOSCOT Spirit Collection translates the bold, unmistakable look of the MOSCOT Originals into styles that are a little bit more mellow and easy going -- but still distinctively MOSCOT. The Collection honors the MOSCOT Originals by reinterpreting classic design elements that look great on all face shapes and sizes. Available as ophthalmic eyewear or sunglasses, the Collection is available with or without a prescription, in a variety of frame and lens color combinations and sizes. Whether you're hiding from the sun or from prying eyes, The MOSCOT Sun Collection provides the perfect cover. Oversized and dramatic, or sleek and modern, MOSCOT Sun has a frame for every face. The Collection features CR-39 lenses for 100% UVA and UVB sun coverage, and can be made with or without a prescription. Who says protection can't be fun?